Any and all discounts and offers may be amended and / or finished off from time to time at the sole discretion of MCB Bank. 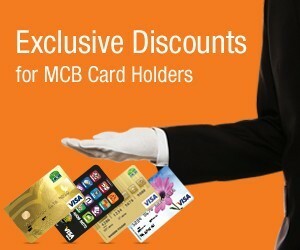 The discount offers can only be availed with MCB Cards and cannot be combined with any other offer / discount / promotion. MCB Bank disclaims any and all responsibility / liability regarding transactions / business of the discount offering partners. MCB Bank is offering these discount offers for customer facilitation and MCB Bank further disclaims any and all liability arising out of the discounts, deals and / or offers. For more information, please call 111 000 622.